Sitting at the table at lunch today, Jason (5.5 year old) knocks his milk over by accident. No biggie, but he makes no attempt to pick up the milk cup to stop more from spilling out. Me: (frantically) Jason honey! pick up your cup the milk is spilling out! Jason: Mom, I'm just pretending to be BP! I blame you for giving me an unstable cup! I've spilt the milk too... my body is still cooked from Quassy... I'm cranky, short tempered, tired and did I mention CRANKY!!! 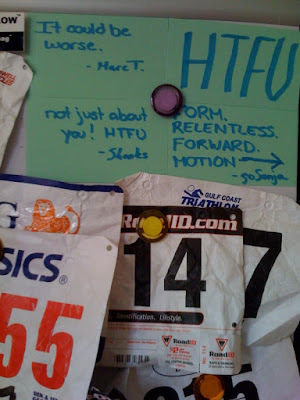 I was just having the same "uncharted waters" type thoughts on my run this morning. Normally the finish line of a half is the end, now it is just a stepping stone. The more it hurts now, the less it will hurt at mile 130. Just found you!!! Hang in there, Buttercup, you can do this!